Do you love classic cars as much as we do? From a 1969 Boss 429 Mustang to a 1963 Corvette Stingray, a beautiful classic car makes us smile every time it zips by us on a country road. If you have a classic car or are considering purchasing one, you need the right insurance policy. Bradley’s Insurance partners with Hagerty Insurance to provide you with the most comprehensive insurance policy. Why do classic cars require a different auto policy than your everyday car? No two car collectors are alike, and some spend more time in their vehicles than others. Some collectors drive their vehicles on a daily basis while others reserve usage for weekend joy rides. If you only drive your classic car on special occasions, you won’t be limited to a policy with fixed-mile restrictions**. If you experience a covered total loss, you’ll be compensated for the total insured value of your vehicle. * Hagerty Insurance takes the hassle out of classic car insurance. Hagerty Insurance classic car specialists have a passion for collector cars so that they can understand exactly the type of coverage your car needs. Created specifically for collector cars, this coverage provides a comprehensive 24/7 full service roadside assistance program. Whether you run out of gas, have a flat tire or need a battery jump, we’ve got you covered. This service even provides guaranteed flatbed towing with soft straps if needed. In comparison to daily driver insurance, you can save big bucks with our policies specifically designed for classic cars. Are you restoring a classic car yourself? Hagerty’s offers an insurance policy to cover your car during all phases of restoration. Are you taking your classic beauty on a cross-country spin? Sign up for the Traveling Collector Endorsement to provide coverage for any unexpected mishaps while on the road. Classic cars require different parts and tools than your everyday vehicle, which can be pricey. This specific policy provides insurance for the parts and tools you acquire for your classic car. Are you interested in surety bonds? Hagerty’s provides Lost or Defective Title Bonds, which are requested by the Secretary of State of DMV to register cars with defective or lost titles. Hagerty’s also offers Dealer Bonds, which are necessary to obtain a dealer’s license. This policy is designed for those who prefer to keep their vehicle in the event of a covered total loss. You can receive the full guaranteed value and still own your vehicle. 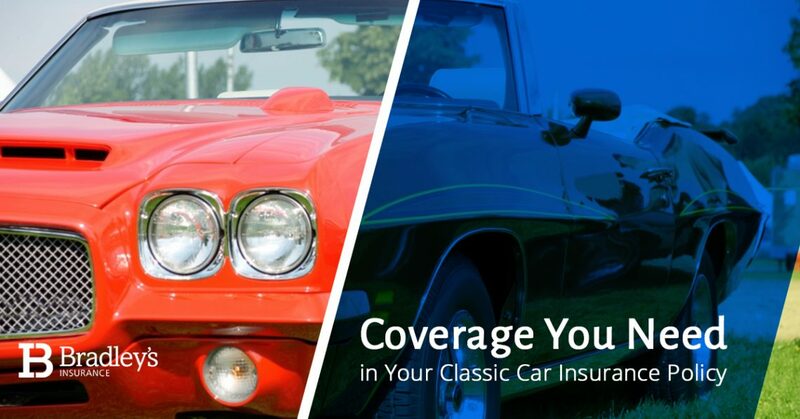 Clearly, Hagerty’s offers everything you need for classic car coverage, which is why our insurance company partners with them. Even if you don’t own a collector car, our insurance specialists can help you find the right auto insurance or other personal insurance. Whether you are looking for boat insurance for home insurance, we’ve got you covered at Bradley’s Insurance. Contact our insurance company in Stittsville to get started.